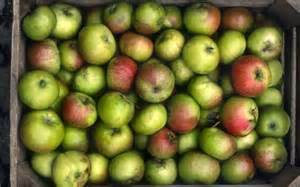 There has been a really good UK apple harvest this year and if you don't have your own apple trees to reap the benefits, like I do, then the supermarkets are bulging with Bramley Apples. Ideal for cooking in various forms, Bramleys are a real favourite in our kitchen. Here are a few 'ways with Bramleys' for your to try this weekend. 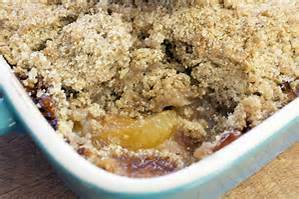 Crumble - For the very best apple crumble, use two thirds Bramleys, for their tartness and fluffy texture, and one third eating apples, which will keep their shape when cooked. opwith your favourite buttery crumble mix and bake until bubbling (below). Spice - Cook peeled, cred and chopped Bramley apples with a dash of water, a generous pinch of mixed spices and sugar, to taste. Microwave for a couple of minutes and then serve your spiced apple compote with Greek style yogurt and granola for breakfast. Mix - Try stirring in some chopped mint or fresh thyme leaves into your apple sauce as a simple flavour twist. Or cook a handful of cranberries with the apples for an alternative to traditional cranberry sauce, and freeze ready for Christmas. Slice - Make easy pies; cut out 12 cm discs from ready-rolled puff pastry and add a few peeled Bramley apple slices to one side of each. Add some diced marzipan and dried cherries. Fold the pastry into half moons (like mini pasties) and seal the pies. Glaze with milk and sprinkle with sugar. Bake at 190'C, or fan oven 170'C or Gas Mark 5 for 25 to 30 minutes. Enjoy your Bramleys, I will!